Should you wish to be contacted by phone, kindly indicate a convnient time for a call from one of our experts. 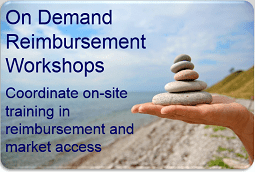 Speak with a reimbursement consultant - Coordinate a call today. Contact a reimbursement expert via email - Reply within 24 hours. The MedTech Conference, Advamed: September 23 - 25, 2019, Boston, MA. Medica: November 18 - 21, 2019, Düsseldorf, Germany. J.P. Morgan 38th Annual Healthcare Conference: January 13 - 16, 2020, San Francisco, CA. Latest Articles - Explaining reimbursement systems and mechanisms (no subscription, no fees). Quote - Obtain timeframes and prices. Email Updates - Register to receive reimbursement related news and articles. How to Avoid the Biomed Reimbursement Casino. Synchronizing Reimbursement and Regulatory Activities. 5 Tips for International Medical Device Reimbursement. Breaking the Myths of Medical Device Reimbursement. Medical Device Reimbursement - Lean Startup Implementation. Reimbursement Strategy DO's and DONT's. Reimbursement of Medical Devices by Distributors. Belgium - Reimbursement of medical implants. Copyright © 2019 Mediclever Ltd. All rights reserved.